Malaria is a curable disease if the patients have access to early diagnosis and prompt treatment. Antigen-based rapid diagnostic tests (RDTs) have an important role at the periphery of health services capability because none of the rural clinics has the ability to diagnose malaria on-site due to a lack of microscopes and trained technicians to evaluate blood films. Furthermore, in regions where the disease is not endemic, laboratory technologists have very limited experience in detecting and identifying malaria parasites. An ever increasing numbers of travelers from temperate areas each year visit tropical countries and many of them return with a malaria infection. The RDT tests are still regarded as complements to conventional microscopy but with some improvements it may well replace the microscope. The tests are simple and the procedure can be performed on the spot in field conditions. These tests use finger-stick or venous blood, the completed test takes a total of 15–20 minutes, and a laboratory is not needed. The threshold of detection by these rapid diagnostic tests is in the range of 100 parasites/µl of blood compared to 5 by thick film microscopy. An accurate diagnosis is becoming more and more important, in view of the increasing resistance of Plasmodium falciparum and the high price of alternatives to chloroquine. The enzyme pGluDH does not occur in the host red blood cell and was recommended as a marker enzyme for Plasmodium species by Picard-Maureau et al. in 1975. The malaria marker enzyme test is suitable for routine work and is now a standard test in most departments dealing with malaria. 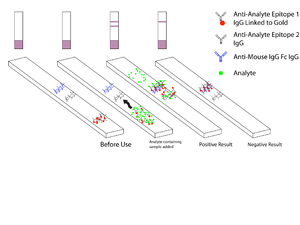 Presence of pGluDH is known to represent parasite viability and a rapid diagnostic test using pGluDH as antigen would have the ability to differentiate live from dead organisms. A complete RDT with pGluDH as antigen has been developed in China and is now undergoing clinical trials. GluDHs are ubiquitous enzymes that occupy an important branch-point between carbon and nitrogen metabolism. Both nicotinamide adenine dinucleotide (NAD) EC 1.4.1.2] and nicotinamide adenine dinucleotide phosphate (NADP) dependent GluDH [EC 1.4.1.4] enzymes are present in Plasmodia; the NAD-dependent GluDH is relatively unstable and not useful for diagnostic purposes. Glutamate dehydrogenase provides an oxidizable carbon source used for the production of energy as well as a reduced electron carrier, NADH. Glutamate is a principal amino donor to other amino acids in subsequent transamination reactions. The multiple roles of glutamate in nitrogen balance make it a gateway between free ammonia and the amino groups of most amino acids. Its crystal structure is published. The GluDH activity in P.vivax, P.ovale and P. malariae has never been tested, but given the importance of GluDH as a branch point enzyme, every cell must have a high concentration of GluDH. It is well known that enzymes with a high molecular weight (like GluDH) have many isozymes, which allows strain differentiations (given the right monoclonal antibody). The host produces antibodies against the parasitic enzyme indicating a low sequence identity. The histidine-rich protein II (HRP II) is a histidine- and alanine-rich, water-soluble protein, which is localized in several cell compartments including the parasite cytoplasm. The antigen is expressed only by P. falciparum trophozoites. HRP II from P. falciparum has been implicated in the biocrystallization of hemozoin, an inert, crystalline form of ferriprotoporphyrin IX (Fe(3+)-PPIX) produced by the parasite. A substantial amount of the HRP II is secreted by the parasite into the host bloodstream and the antigen can be detected in erythrocytes, serum, plasma, cerebrospinal fluid and even urine as a secreted water-soluble protein. These antigens persist in the circulating blood after the parasitaemia has cleared or has been greatly reduced. It generally takes around two weeks after successful treatment for HRP2-based tests to turn negative, but may take as long as one month, which compromises their value in the detection of active infection. False positive dipstick results were reported in patients with rheumatoid-factor-positive rheumatoid arthritis. Since HRP-2 is expressed only by P. falciparum, these tests will give negative results with samples containing only P. vivax, P. ovale, or P. malariae; many cases of non-falciparum malaria may therefore be misdiagnosed as malaria negative (some P.falciparum strains also don’t have HRP II). The variability in the results of pHRP2-based RDTs is related to the variability in the target antigen. P. falciparum lactate dehydrogenase (PfLDH) is a 33 kDa oxidoreductase [EC 1.1.1.27]. It is the last enzyme of the glycolytic pathway, essential for ATP generation and one of the most abundant enzymes expressed by P. falciparum. Plasmodium LDH (pLDH) from P. vivax, P. malariae, and P. ovale) exhibit 90-92% identity to PfLDH from P. falciparum. pLDH levels have been seen to reduce in the blood sooner after treatment than HRP2. In this respect, pLDH is similar to pGluDH. Nevertheless, the kinetic properties and sensitivities to inhibitors targeted to the cofactor binding site differ significantly and are identifiable by measuring dissociation constants for inhibitors which, differ by up to 21-fold. Fructose-bisphosphate aldolase [EC 4.1.2.13] catalyzes a key reaction in glycolysis and energy production and is produced by all four species. The P.falciparum aldolase is a 41 kDa protein and has 61-68% sequence similarity to known eukaryotic aldolases. Its crystal structure has been published. The presence of antibodies against p41 in the sera of human adults partially immune to malaria suggest that p41 is implicated in protective immune response against the parasite. ^ a b c Ling IT. ; Cooksley S.; Bates PA.; Hempelmann E.; Wilson RJM. (1986). "Antibodies to the glutamate dehydrogenase of Plasmodium falciparum". Parasitology. 92 (2): 313–324. doi:10.1017/S0031182000064088. PMID 3086819. ^ a b Rodríguez-Acosta A, Domínguez NG, Aguilar I, Girón ME (1998). "Characterization of Plasmodium falciparum glutamate dehydrogenase-soluble antigen". Braz J Med Biol Res. 31 (9): 1149–1155. doi:10.1590/S0100-879X1998000900008. PMID 9876282. ^ a b Li Y, Ning YS, Li L, Peng DD, Dong WQ, Li M (2005). "Preparation of a monoclonal antibodies against Plasmodium falciparum glutamate dehydrogenase and establishment of colloidal gold-immunochromatographic assay". Di Yi Jun Yi da Xue Xue Bao = Academic Journal of the First Medical College of PLA. 25 (4): 435–438. PMID 15837649. ^ Warhurst DC, Williams JE (1996). "ACP Broadsheet no 148. July 1996. Laboratory diagnosis of malaria". J Clin Pathol. 49 (7): 533–38. doi:10.1136/jcp.49.7.533. PMC 500564. PMID 8813948. ^ Moody A. (2002). "Rapid Diagnostic Tests for Malaria Parasites". Clin Microbiol Rev. 15 (1): 66–78. doi:10.1128/CMR.15.1.66-78.2002. PMC 118060. PMID 11781267. ^ Murray CK, Bennett JW (2008). "Rapid Diagnosis of Malaria". Interdiscip Perspect Infect Dis. 2009: 1–7. doi:10.1155/2009/415953. PMC 2696022. PMID 19547702. ^ Picard-Maureau A, Hempelmann E, Krämmer G, Jackisch R, Jung A (1975). "Glutathionstatus in Plasmodium vinckei parasitierten Erythrozyten in Abhängigkeit vom intraerythrozytären Entwicklungsstadium des Parasiten". Tropenmed Parasitol. 26 (4): 405–416. PMID 1216329. ^ Werner C, Stubbs MT, Krauth-Siegel RL, Klebe G (2005). "The crystal structure of Plasmodium falciparum glutamate dehydrogenase, a putative target for novel antimalarial drugs". J Mol Biol. 349 (3): 597–607. doi:10.1016/j.jmb.2005.03.077. PMID 15878595. ^ a b Iqbal J, Sher A, Rab A (2000). "Plasmodium falciparum Histidine-Rich Protein 2-Based Immunocapture Diagnostic Assay for Malaria: Cross-Reactivity with Rheumatoid Factors". J Clin Microbiol. 38 (3): 1184–1186. PMC 86370. PMID 10699018. ^ Beadle C, Long GW, Weiss WR, McElroy PD, Maret SM, Oloo AJ, Hoffman SL (1994). "Diagnosis of malaria by detection of Plasmodium falciparum HRP-2 antigen with a rapid dipstick antigen-capture assay". Lancet. 343 (8897): 564–568. doi:10.1016/S0140-6736(94)91520-2. PMID 7906328. ^ Rock EP, Marsh K, Saul AJ, Wellems TE, Taylor DW, Maloy WL, Howard RJ (1987). "Comparative analysis of the Plasmodium falciparum histidine-rich proteins HRP-I, HRP-II and HRP-III in malaria parasites of diverse origin". Parasitology. 95 (2): 209–227. doi:10.1017/S0031182000057681. PMID 3320887. ^ Humar A, Ohrt C, Harrington MA, Pillai D, Kain KC (1997). "Parasight F test compared with the polymerase chain reaction and microscopy for the diagnosis of Plasmodium falciparum malaria in travelers". Am J Trop Med Hyg. 56 (1): 44–48. doi:10.4269/ajtmh.1997.56.44. PMID 9063360. ^ Baker J, McCarthy J, Gatton M, Kyle DE, Belizario V, Luchavez J, Bell D, Cheng Q (2005). "Genetic diversity of Plasmodium falciparum histidine-rich protein 2 (PfHRP2) and its effect on the performance of PfHRP2-based rapid diagnostic tests". J Infect Dis. 192 (5): 870–877. doi:10.1086/432010. PMID 16088837. ^ Bzik DJ, Fox BA, Gonyer K (1993). "Expression of Plasmodium falciparum lactate dehydrogenase in Escherichia coli". Mol Biochem Parasitol. 59 (1): 155–166. doi:10.1016/0166-6851(93)90016-Q. PMID 8515777. ^ Vander Jagt DL, Hunsaker LA, Heidrich JE (1981). "Partial purification and characterization of lactate dehydrogenase from Plasmodium falciparum". Molecular and Biochemical Parasitology. 4 (5–6): 255–264. doi:10.1016/0166-6851(81)90058-X. PMID 7038478. ^ Penna-Coutinho J, Cortopassi WA, Oliveira AA, França TC, Krettli AU (2011). "Antimalarial activity of potential inhibitors of Plasmodium falciparum lactate dehydrogenase enzyme selected by docking studies". PLOS ONE. 6 (7): e21237. doi:10.1371/journal.pone.0021237. PMC 3136448. PMID 21779323. ^ Iqbal J, Siddique A, Jameel M, Hira PR (2004). "Persistent Histidine-Rich Protein 2, Parasite Lactate Dehydrogenase, and Panmalarial Antigen Reactivity after Clearance of Plasmodium falciparum Monoinfection". J Clin Microbiol. 42 (9): 4237–4241. doi:10.1128/JCM.42.9.4237-4241.2004. PMC 516301. PMID 15365017. ^ Brown WM, Yowell CA, Hoard A, Vander Jagt TA, Hunsaker LA, Deck LM, Royer RE, Piper RC, Dame JB, Makler MT, Vander Jagt DL (2004). "Comparative structural analysis and kinetic properties of lactate dehydrogenases from the four species of human malarial parasites". Biochemistry. 43 (20): 6219–6229. doi:10.1021/bi049892w. PMID 15147206. ^ Meier B, Döbeli H, Certa U (1992). "Stage-specific expression of aldolase isoenzymes in the rodent malaria parasite Plasmodium berghei". Mol Biochem Parasitol. 52 (1): 15–27. doi:10.1016/0166-6851(92)90032-F. PMID 1625704. ^ Knapp B, Hundt E, Küpper HA (1990). "Plasmodium falciparum aldolase: gene structure and localization". Mol Biochem Parasitol. 40 (1): 1–12. doi:10.1016/0166-6851(90)90074-V. PMID 2190085. ^ Kim H, Certa U, Döbeli H, Jakob P, Hol WG (1998). "Crystal structure of fructose-1,6-bisphosphate aldolase from the human malaria parasite Plasmodium falciparum". Biochemistry. 37 (13): 4388–96. doi:10.1021/bi972233h. PMID 9521758. ^ Srivastava IK, Schmidt M, Certa U, Döbeli H, Perrin LH (1990). "Specificity and inhibitory activity of antibodies to Plasmodium falciparum aldolase". J Immunol. 144 (4): 1497–503. PMID 2406342. This page was last edited on 18 February 2019, at 14:54 (UTC).